What is the real nature of Hamas? Since their astonishing victory in the 2006 Palestinian elections, this has become the most hotly-contested question in the Middle East. How do they really operate? How ‘Islamic’ are they? What personalities lie beneath the black-and-green uniforms? In this explosive book, Palestinian-born journalist, Zaki Chehab draws on his unique insider sources to tell the story of this radical movement as it has never been told before. He shows how Hamas developed with the implicit encouragement of the Israelis (they bought their first weapons cache from the Shin Bet, Israel’s domestic security agency), who wanted to weaken Fatah. He uncovers the extent of the Israeli intelligence services’ penetration of the organisation, even at the highest levels. Interviewing key figures, he offers completely new insights in to Hamas. He reveals for the first time how they prepare their ‘martyrs’ for suicide bombing attacks. He investigates their relationship with other groups, such as Hezbollah and Al Qaeda. The picture which emerges is of a political leadership driven above all else by a desire for power. This authoritative book is essential reading for anyone who cares about the Israeli-Palestinian conflict and the future of the Middle East. 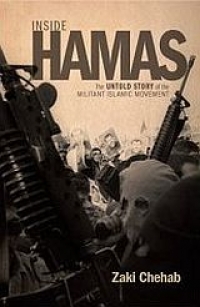 Understanding the nature of Hamas is essential to understanding the nature of the wider Middle Eastern question. Zaki Chehab is one of our shrewdest and best informed commentators on Arab matters, and this book is essential reading for both the expert and the general reader. Highly recommended. Zaki Chehab uses extraordinary access to produce the most comprehensive account yet of a movement without whom there can be no lasting Middle East settlement. Highly readable, this is an important and insightful contribution to understanding one the world's great unresolved wounds. A most illuminating and riveting read. This account takes the reader through the faltering steps that brought Hamas from the shadows of Palestinian society to centre stage in the politics of the Middle East. Chehab has an ability to get inside the story. Hamas cannot be wished away, unless and until there is an end to occupation. Without that, he warns, the spectre of even greater extremes of hopelessness and violence beckons. obvious that Chehab has had access to some of the PLO's most sensitive files. A colourful first-hand account...a well-informed contribution to a highly emotive and pressingly topical issue.